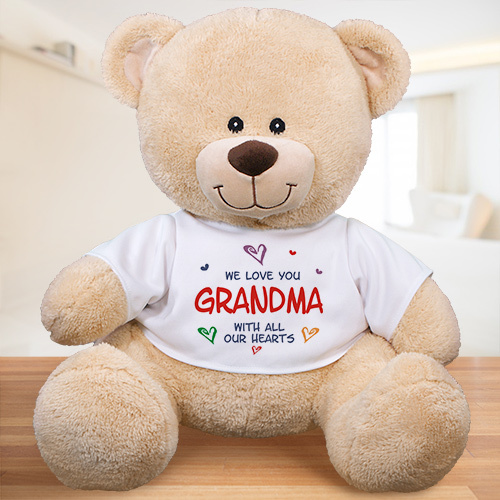 Let your Grandma, Mom, Aunt or even Grandpa know they are loved unconditionally with this warm and fuzzy All Our Hearts Personalized Teddy Bear. Grandma Gifts like this heartwarming teddy bear is sure to steal your Grandmother's heart the moment she gazes upon it. A thoughtful gift of love given with kindness. This teddy bear features an irresistible look on his face along with a wonderfully soft feel. He has contrasting tan fur on the inside of his ears and his snout. Choose between three great sizes ranging from 11" to 21"! Free personalization is included. Personalized your All Our Hearts Teddy Bear with any title. Please specify "I love you" or "We Love You." ( ie. Grandma ) We apologize, at this time we do not offer a gift box large enough to hold our 17" or our 21" Sherman Teddy Bear. Very cute and soft bear, worth the money. Wish personalization had names from whom the gift came from. I ended up writing those in with a thin sharpie, there was room for it on the bear's shirt. Great grandma loved it! Additional Details Shop GiftsForYouNow.com for all your Custom Plush Teddy Bear Gifts. Perfect for anyone on your shopping list. Let grandma know she's the best by also including our Engraved Grandma Picture Frame & our Personalized Gray Hares T-Shirt as well.